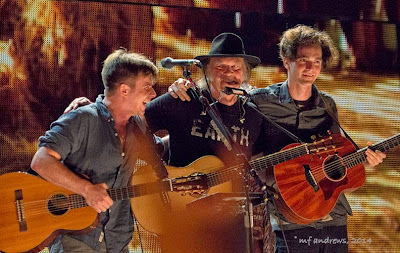 The Photo of the Moment is from Farm Aid 2014 in Raleigh, NC on September 13, 2014 of Lukas Nelson, Neil Young and Micah Nelson (Willie Nelson's sons) at the conclusion of the song "Rockin' in the Free World". Photo by M.F. Andrews. Thanks Mary! We'll have a bit more to say on Farm 2014 tonight, Saturday, Sept 20 at 9:00 PM EST, on the Thrasher's Wheat Radio Hour from WBKM.org. Tonight's edition will feature Farm 2014 highlights, discussion and news.